Santa Rosa, Calif. – May 24, 2016 ATIV Software announced today the release of the ATC16 medical meeting app, built on the dynamic EventPilot platform, for the annual American Transplant Congress jointly held by the American Society of Transplantation (AST) and the American Society of Transplant Surgeons (ASTS). The ATC16 event app provides attending professionals a comprehensive messaging option. This allows attendees to better connect with one another based on similar research interests and transplantation specialties. Learn more at http://ativsoftware.com. In addition to providing the entire conference proceedings, including thousands of offline searchable research abstracts, EventPilot meeting apps simplify attendee networking at large events. The EventPilot Peer Finder Module provides search and filtering capabilities within the registered attendee list. Attendees’ privacy is ensured as no personal contact information is published in the app. Attendees connect via the private in-app messenger tool. With the EventPilot conference app, meeting planners equip attendees with a sustainable event program and a private networking solution. Registered attendees can save time and make meaningful connections via Peer Finder by filtering for fellow attendees based on pre-set criteria such as area of expertise or research interest. Attendees can directly message one another without revealing personal contact information, allowing for long-lasting idea sharing on the latest research topics. Designed specifically for large medical and scientific meetings, EventPilot conference apps natively contain all session materials, including ePosters. Full text offline search capabilities ensure event app users have instant access to the latest research findings. The free iPhone and iPad meeting app is available now in the App Store. The free Android event app is available in Google Play. Search “ATC16”. A web version is available for Windows Phones and other web-enabled devices. 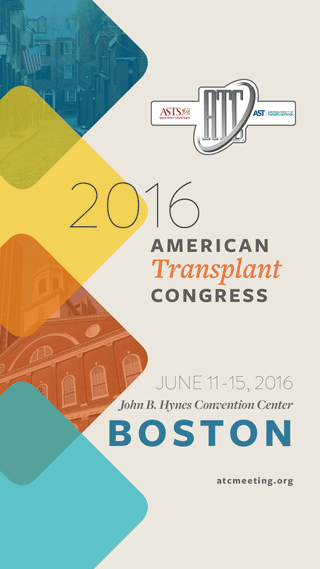 The 2016 American Transplant Congress (ATC) is the joint annual meeting of the American Society of Transplant Surgeons (ASTS) and the American Society of Transplantation (AST), being held June 11-15 in Boston, MA. The program encourages the exchange of new scientific and clinical information and supports an interchange of opinions regarding care and management issues, as well as socioeconomic, ethical and regulatory issues relevant to organ and tissue transplantation. To learn more, visit atcmeeting.org.